All of us at Friends of Acadia are mourning the loss of a great friend of this park and this organization, David Rockefeller, who passed away peacefully last night at his home in NY at age 101. As we extend our sympathies to his family and his many friends throughout our community, we also celebrate a very full life and a legacy of gracious generosity and public-spirited conservation that will live on forever. Mr. Rockefeller was active in his commitment and leadership here at Acadia right up until the time of his death, serving for the past three years as an Honorary Chairman of FOA’s Second Century Campaign. He also was instrumental in FOA’s earliest years, helping to launch the campaign to restore and maintain Acadia’s carriage roads in the early 1990s. Mr. Rockefeller’s father, John D. Rockefeller Jr. was one of the founders of Acadia National Park one hundred years ago, and the family’s tradition of involvement and support for national parks extends well beyond Acadia to dozens of other parks throughout the nation. As Mr. Rockefeller himself, noted, however, Maine has always held a special place in his heart. And the same can be said of the place he will continue to hold in all of our hearts here at FOA. 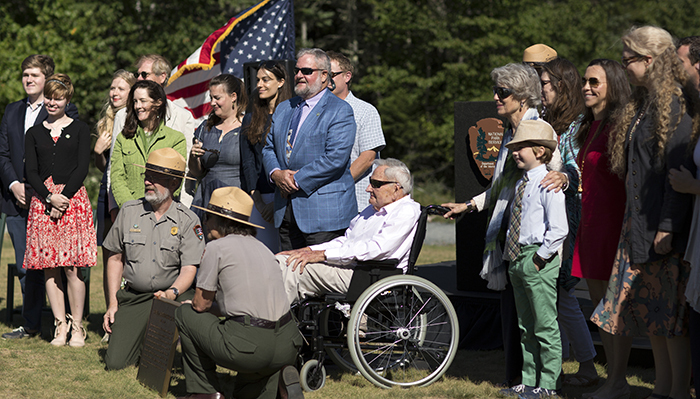 Photo: David Rockefeller and the Rockefeller family were honored at the August 27, 2016 “Gift of Acadia” celebration for the Acadia National Park and National Park Service centennials. FOA photo.